Washington’s runaway gusher of spending makes the Deepwater Horizon disaster look small and simple to stop. Congress is debating another irresponsible round of extra spending (although they refuse to call it “son of stimulus”) before they take a Memorial Day break. The measure would add an estimated $84-billion (or perhaps $100-billion) to the deficit. That’s actually good news, because earlier this week they planned to spend $50-billion more, until some Democrats joined Republicans in balking. The bad news is that Congress refuses to adopt a budget that would describe how much more they intend to spend over the next five years—or even to tell us how much more they will spend this year. In addition, another spending bill is moving thru Congress–with $60-billion that is mostly to finance the war in Afghanistan—which is also deficit spending not included in official budget numbers. An uncontrolled geyser of spending keeps spewing money from Washington. There is no plan to clean-up the long-term financial mess—even if the gusher stopped today. 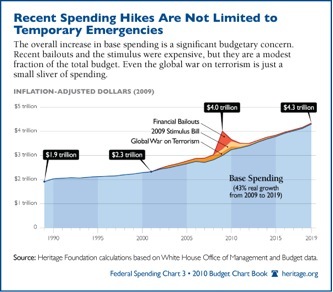 There is no blowout preventer for federal spending. There is no disaster relief plan. Capping the undersea geyser is simple compared to capping spending. The undersea oil spill is only a mile deep, but Washington’s problems go down to the core. The supposed safety valve of “PAYGO” rules—to require new spending to be offset by new revenue or other spending cuts—is proving as futile as the blowout preventer on the BP well. PAYGO was a faulty design to begin with, drafted to provide political cover rather than actually to work. Moody’s bond rating service keeps warning that runaway spending is on the verge of costing the U.S. its AAA bond rating—meaning higher interest charges. Failure to plan is a big part of the BP disaster, and a big part of DC’s as well. The culpability of BP’s management is minor compared to elected officials who won’t control spending, but instead push the debt onto Generation X, the Millennials, and whoever is next. For those who counter by accusing Republicans of spending too much, I agree with you. But that’s no excuse for even greater deficit spending by the current Democrat-run government. Most of us learned in kindergarten that someone else’s misbehavior is no excuse for our own. BP at least has worked to shut off the flow; Washington is opening the spigot even wider. Nobody knows how long it will take to clean up the mess in the Gulf, but one thing’s for certain: Cleaning up the fiscal mess will take a lot longer. Ernest Istook served 14 years in the U.S. Congress and is now a distinguished fellow at The Heritage Foundation.